So, what’s The Difference Between Flat White and Cappuccino? Lately, there has been a lot of talk and debate over two very traditionally different drinks that are slowly becoming very similar. As the Third wave of coffee is crashing over the world there are a lot of changes being made to classic coffee methods and ideals, from brewing, to technic and the ethics behind the whole coffee experience. We have seen new styles being introduced to coffee for the better half of the last decade one of the most noticeable changes has come from the many new drinks that involve coffee. Everyone from Baristas, roasters and probably you as well have been mixing their coffee with things like tonic water, ice cream and of course milk! So lets take a look at two very popular drinks, A flat white and a cappuccino drink. In most third wave coffee shops you’ll find one of these two and or maybe both. The history of these two drink couldn’t be more different so lets start with the cappuccino. The cappuccino is an age old drink that dates back to the 1900s this drink has been a staple morning drink for many Europeans. The tradition is to have a cappuccino served in a 5-6 oz cup with espresso milk the a semi-thick layer of micro-foam that has been aerated slightly longer to softly lay over the top of the drink. Now The flat white was first brought to light in the 1980s in Australia and New Zealand. There’s no doubt that the drink draws inspirations from the much older cappuccino but with its own twist. A flat white will more commonly then not have less milk and be fully integrated into the espresso. Once the pour is finished the micro-foam will naturally set apart and create a layer of milk over the drink. There are many baristas alike that have chosen a side saying the Flat white has a stronger flavor with perfect mix of milk and espresso. Others saying that the cappuccino is the drink that best mixes milk with espresso without being overpowered by the other. Sometimes the only difference for some people is the vessel that the drink is served in. The more experience I have with either of these drinks I see a common theme being that the milk is almost steamed and integrated the same (by a well-trained barista) and the influence really comes the third wave of coffee that forces on the details in preparing any coffee drink every step of the way, As for me I enjoy both and will be okay with whatever way the shop choices to prepare for me. 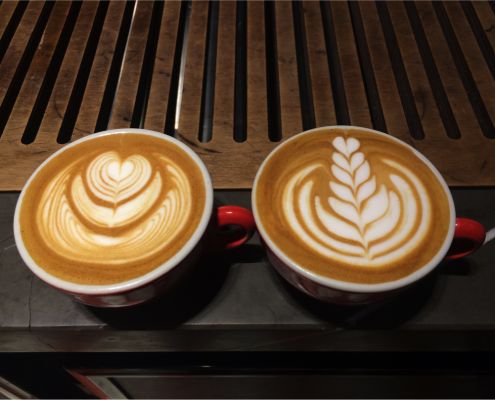 Next time you go into a specialty coffee shop maybe see for yourself what the differences are between a flat white vs. a cappuccino?